1. Surfing history books make little mention of paipo so can we start with when you first rode a paipo? It was the summer of 1960. I’d been board surfing at Canoes in Waikiki, and after I was done, I walked from the old Outrigger Canoe Club, which was where the Outrigger Waikiki Hotel is today, down to Queen’s, where the Duke Statue is. I was standing on the beach and I saw a guy riding a bellyboard at Queen’s. It was the fastest thing I’d ever seen in the waves. I waited on the beach until he came in. His wife and his infant daughter were on the beach, and I went up and introduced myself. His name was John Waidelich. John told me he had a shop at his house on 13th Avenue in Kaimuki and invited me to come over. I went to his house and he made me a paipo board out of 3/4 inch plywood. The only thing he put on it was varathane. So the summer of 1960 was when I got my first paipo board and when I first rode one. 2. I believe that you first became interested in paipo in 1960 when you saw John Waidelich surfing Publics. What was it that attracted you to paipo? It was the summer of 1960, but I saw John at Queen’s, not Publics. What attracted me to paipo was the speed. 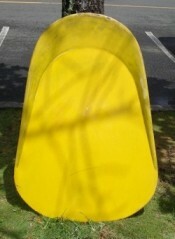 I also liked the paipo because you could ride any sized wave with it, and it usually popped up close if you wiped out. 3. A lot of guys in Hawaii started off on paipo and then progressed to stand up boards through their teens. Were there many guys your age and older riding paipo at the time? There wasn’t a normal progression to go from a paipo board to a surfboard. Usually, you rode one or the other. Most of the paipo riders in 1960 rode at The Wall in Waikiki, which is at the intersection of Kalakaua Avenue and Kapahulu Avenue. On big days they rode Cunha’s, the deep water break outside The Wall. I don’t know how many there were, but they were young and old. 4. I've heard that the south shore of Oahu had many popular paipo spots. Where did you mainly surf before you ventured to the north shore? How many paipo would you see out in the surf at the time? We surfed the right at Canoes, Queen’s, and Castle’s when it was breaking, and we were usually the only paipo riders out there. We also surfed Portlock Point, Full Point at Sandy Beach, and Makapuu. Makapuu was the place where everyone rode paipos in the 1960s. 5. Before we talk about the boards that you developed with John, what was your first paipo board like? Was it a do-it-yourself board or were there guys who would make you a paipo? As I mentioned, John made my first paipo. It was about four feet long with parallel rails, and he finished it with varathane. All the boards then were homemade. No one sold them commercially. 6. I've read that it was in 1960 that you and John begin working on your design changes? What changes did you make to the basic paipo design? From photos that I have seen, the area about 18" from the tail all the way around to the nose looks like it was built up on a base of ply. Can you describe how you built up the nose and rail areas on your boards and got the curves in the bottom. Were the boards flat bottomed? How long did it take to refine your design? In 1960, I decided to make another board. I wanted a new design, something different. John and I tried to analyze what changes would make it faster. We decided it would plane better with a wider tail, but we also realized that the flat bottom is what gives it the speed. Rocker slows it down, so we kept the bottom flat and only put a little rocker in the nose of the board. We made two boards, one for John and one for me. 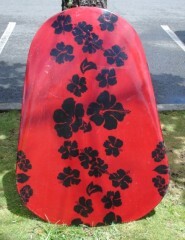 John put an aloha print fabric on his board and finished it with resin. I used fiberglass on mine. I still have our two original boards. They are 42 inches long by 30 inches wide. The rear edges are slightly rounded. We made them with 3/8 inch marine ply, which is one of the reasons why they lasted so long. The nose and the sides of the boards were built up with three, U-shaped pieces of 3/8 ply, which we glued to the boards with waterproof glue. Each piece was offset about 3/8 of an inch. This made it possible for us to grind them down to a smooth surface on the underside. On the top we used a spoke shave and chisels. This gave us a rise of approximately 12 eights- of- an-inch, including the bottom and the three pieces of wood that we glued onto the bottom. We found that the wide tail helps to get into big waves faster. Then once we dropped in, we’d put one arm out, our inside arm, and lean on the inside rail to get an edge into the wave. I don’t think John made any other boards, but he helped other people make boards. On one occasion a guy named Mike Irwin, who became a psychiatrist and now lives on the mainland, lived with his parents at the top of Wilhelmina Rise while he was going to medical school. One day he was studying and he could see big streaks of white slashing across the waves at Publics. He couldn’t tell with his naked eye what was causing it, so he jumped in his car and rode down to the beach to see firsthand what was going on. When we came in, he was so excited about having a board that John took him back to his house and gave him a list of things to buy. He came by again that evening and we shaped the board that night, and he was riding it a day or two later. 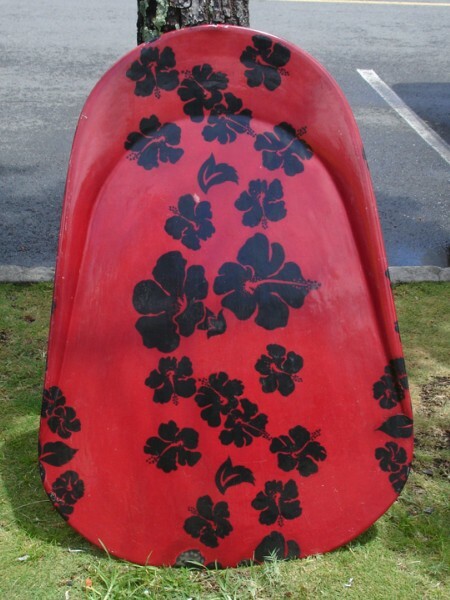 A number of Outrigger members also made paipo boards and used to surf with us for a number of years. I moved to the Big Island in about 1978 and lived there for approximately 20 years. John and I would surf together occasionally during my frequent trips to Honolulu. He loved to surf alone in front of the breakwater in Ala Moana Park, and I think he contined to do so until he died. 7. What year did your boards first get labeled as paipo? What were they referred to as previously? 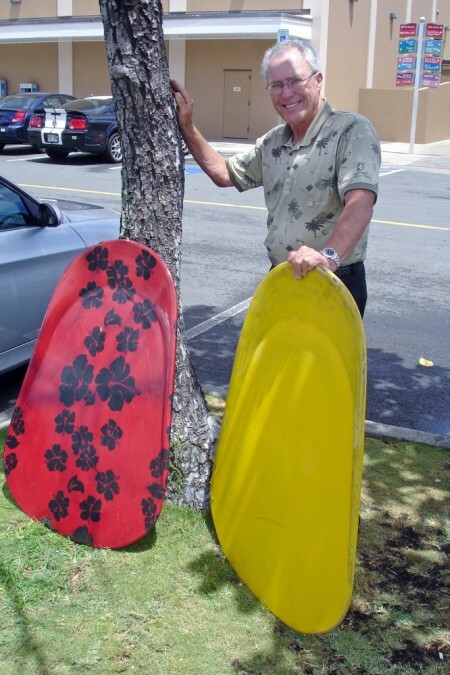 In 1960, we knew the boards as bellyboards, but we also knew the name paipo boards. The local riders always used the term paipo boards. John suggested for fun that we call them poi-pu boards, combining the Hawaiian words “poi”, a basic Hawaiian food starch, and “opu”, or stomach. I told him I didn’t think that would work, so we called them paipo boards. 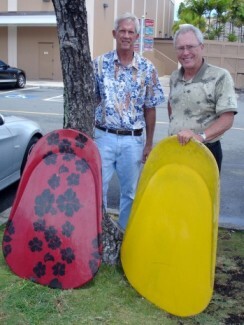 Then wherever we rode the boards, like at Makapuu, we told people who asked that they were paipo boards. 8. Did you and John collaborate with Val Valentine to use moulds? We got to know Val Valentine when we started surfing the North Shore, and the three of us became friends. Val was interested in making and selling paipos like the ones we were riding, so Val and John made a concrete press. They took a mold off of one of our original boards by putting it into the concrete while it was still wet. When they were ready to make a board, they would wet the plywood, steam it, and put it into the concrete press. So Val’s boards had the same design that ours did: rocker in the front and flat bottom in the back. Val called them Paipo Nui boards. He’s the one that thought of the name. The boards were popular and sold well, but Val only made boards when he needed money. 9. 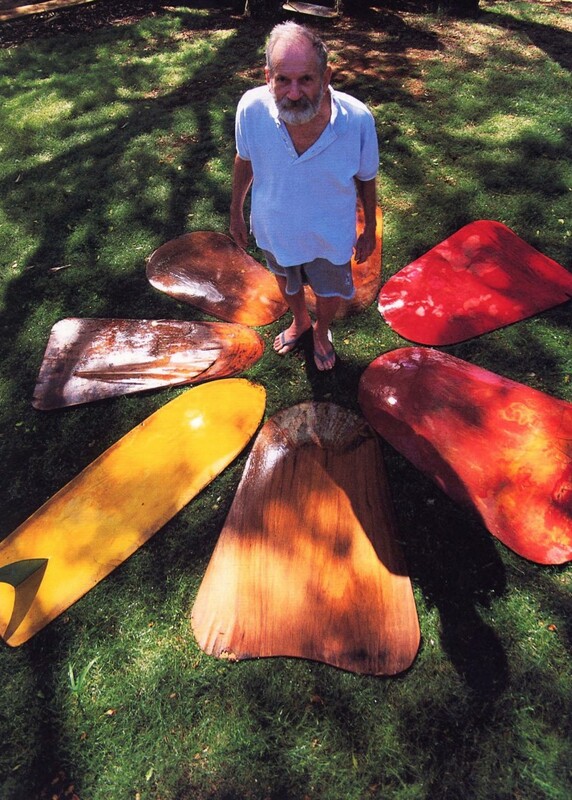 There is a 2000 photo with Paul Swanson surrounded by paipo boards that belonged to Val Valentine [see Note 1]. Can you talk us through the different boards, their background when they were made etc.? 10. Body boards have been credited with the demise of the paipo. 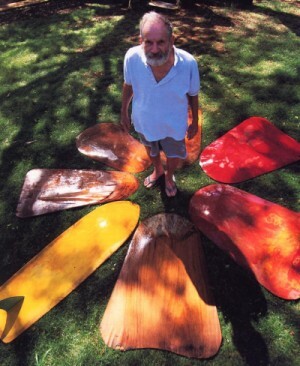 When did the sale of your boards drop off - how many were you making during the "paipo boom?" John and I never sold any paipo boards. John helped Val Valentine set up his Paipo Nui operation, but neither of us ever got involved with the commercial side of it. 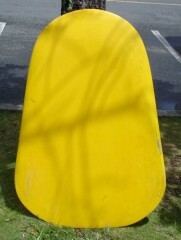 As for the introduction of bodyboards leading to the demise of paipo boards, I would say that was true. 11. I gather Sunset was a favourite spot for testing your designs. Did you ride the boards at Pipeline? How did they go in hollow tubes? We tried the Pipeline, but it was hard for us to get down, to make the drop, the waves were so steep. One day we tried Pipeline when it was a big, breaking on the second reef way outside the normal lineup. It was an enormous day. We got in by dropping in on the shoulder, and the rides were spectacular, but short. Bud Browne was on the beach filming. The shorebreak was enormous, something like 12 or 15 feet. I was the first one to go in, and I was lucky that I got a double wave, which collapsed and dropped me on the sand softly enough that I wasn’t injured. I ran up the beach, and my board came in with the wave. To my astonishment, John actually caught a wave. He had an awful lot of hair. He got an incredibly fast short ride, turned onto the sand, and the wave broke on him while he was still laying on his board. He had a bump on his chin as big as a golf ball and his ribs hurt for about three weeks. Unfortunately, all of Bud Browne’s films deteriorated before any of them could be saved. The shot of John would’ve been incredible. 12. What tips would you pass on about riding paipo? Did riding Waimea or really big waves require a change in approach? The challenge with big waves is getting into them and making the drop. You only have a pair of fins to try and match the speed of the wave, so we also used one hand to paddle on the takeoffs. We’d try to angle from the shoulder, but the wave was usually vertical when we got into it. A lot of times we would free fall for six or eight feet before we reached the bottom where we could make a turn. Then once we turned and started riding down the line, we’d angle back up the face of the wave to increase our speed. We also learned that for big days, glassy is better. For paipos, bumpy is not good. 13. The speed in your boards is obvious. Are there any rides that still really stand out for you? We had a lot of outstanding days all over the island, on the North Shore, at Makaha, at Makapuu, and at Castle’s. One time during the 1960s, we went to Makaha during one of the international surfing contests that Waikiki Surf Club used to put on. The condos on the beach were still under construction. When we got there, it was point surf and they had just finished the contest. John and I decided to go out, but rather than swim from the beach, we walked out on the point and dived in between sets. People were yelling at us, they thought we were crazy. As we were swimming, a giant set came through, but we made it out. It was one of those classic days. We made every wave from the point through the bowl at the end of the wave. It was just magical. We’d scream across the wall on every wave. Another time John was out at Waimea with Greg Noll. Greg dropped in on John, and John nailed him in the kidney. Greg told John after that he saw him take off, but that he had no idea that the paipo had that much speed. 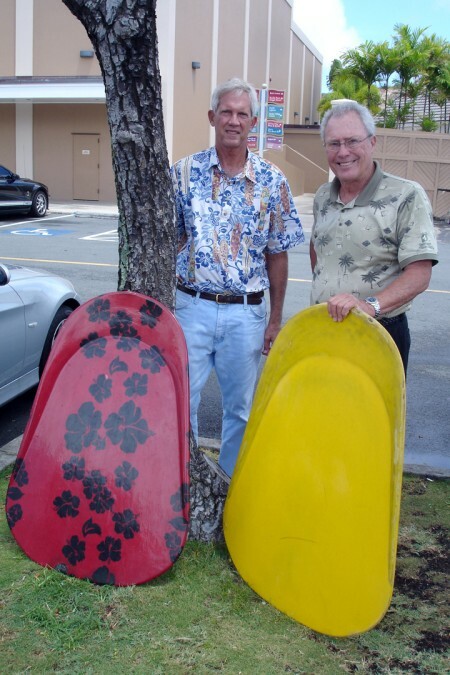 An article about Greg Noll and John appeared in Surfing Magazine sometime in the mid-sixties. It is a great article, and they had a lot of photos. The most memorable ride for both of us was a wave we caught together and rode from Steamer Lane, which is Outside Castle’s, to Canoes. That’s the famous “Duke Kahanamoku” ride. It was the summer of 1965, and the waves were like a big day at Sunset or Avalanche. We made it all the way to Canoes, swam into the beach, and walked back up to the Outrigger Canoe Club, where we had jumped in earlier. That was the only time either one of us made that ride. I wrote a piece called “The Longest Ride” that describes it, which, I believe you and Bob both have copies of. 14. Any other thoughts or recollections? One day John and I were out at Canoes, riding the rights. A guy paddling out to the lineup had been watching us from the beach. He paddled up to me and said, “That’s the fastest board I’ve ever seen.” That was one of the biggest attractions of the paipo for us, its speed. A lot of people modified the design, especially those who did a lot of riding at Makapuu. The most popular thing was to extend the length of the board and cut it square across the back. This made it easier to get into the waves, but it cut down on the maneuverability and the speed because it increased the wetted surface. 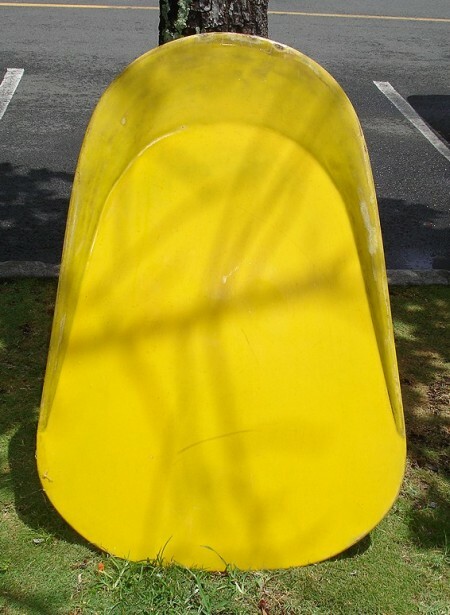 The secret to the speed of the paipo board was that the design reduced the wetted surface to an absolute minimum, and riding prone reduced the wind resistance considerably. For me the greatest thrill about riding a paipo board on really big waves was the feeling of enormous speed that resulted from skimming across the water with my face only inches away from the surface. It gave me the feeling that the paipo board really didn’t exist, that I was skimming across the water unassisted. It is the same feeling that I used to get riding a motorcycle at high speed; it made me feel that I was flying. Jim Growney extends his "outrigger" right arm as he planes, completely out of the water, across a Sunset Beach wall.